Unlike many of my fellow Reformed pastors and thinkers, I never had the time, energy, or interest in Catholic bashing. At Bates College in Maine, pursuing a BA in Philosophy, I benefited from St. Augustine, St. Thomas Aquinas, the Church Fathers, and documents from Vatican II. During my Masters of Divinity studies at Gordon-Conwell Theological Seminary, I never hesitated to consult Catholic Bible scholars, theologians, and historians. I also began to read — on my own and as assigned — Catholic spiritual writers such as St. Teresa of Avila, St. John of the Cross, and Henri Nouwen. My Doctorate of Ministry in Christian Spirituality at Gordon-Conwell featured even more Catholic sources including Church documents and the writings of St. John Paul II. In addition to that, I had grown up in the Eastern Orthodox Church, finding Protestant Evangelicalism (the Anglican strain — C. S. Lewis, John Stott, J. I. Packer, et. al.) while away at boarding school. We read Lewis’ Mere Christianity and Stott’s Basic Christianity and paid little attention to denominational differences. To be honest, I was mostly oblivious to the fire-breathing fear and odium many still feel toward the Catholic Church. I sided with Methodism’s founder John Wesley who wrote A Letter to a Roman Catholic in 1749 — not a time known for ecumenical fervor and cooperation. “But if God still loveth us,” Wesley wrote to his Catholic friend, “we ought to love one another. We ought without this endless jangling about opinions, to provoke one another to love and to good works. Let the points wherein we differ stand aside: here are enough wherein we agree, enough be the ground of every Christian temper and of every Christian action” (Letter to a Roman Catholic, July 28, 1749). Amen. Amen. And Amen. My decision to be ordained in the Presbyterian Church in America (PCA) came well after seminary. I spent quite a few years in business while I remained a licensed Congregational minister (not ordained) actively looking for work in the church or a Christian organization. Over time, however, and while working for a nondenominational youth ministry, I began to see how the Bible teaches that Christian churches should be connected, not independent in the manner that congregationally governed churches are free to do as they wish based on a vote of the members. That belief in an organizationally connected church led me to examine the Episcopal Church as well as various Presbyterian denominations. Since from my point of view the handwriting was already on the wall for the Episcopal Church and the theologically revisionist Presbyterian denominations, I found my way into the PCA. I found it is a biblically sound denomination with a solid commitment to Reformed (Calvinist) orthodoxy. Besides, I had far too many Catholic friends who had vibrant faith walks. These included the Newman chaplain at Bates, a former Trappist monk who was a faithful and dearly loved part of our InterVarsity Christian Fellowship chapter. When I worked in youth ministry in Connecticut, I took monthly personal retreats at a Passionist House where they treated me as though I was a visiting cardinal, ever gracious, generous, and available for spiritual conversation. In California’s Silicon Valley where I was pastor of a PCA church, I found a spiritual director at the Jesuit Retreat House in Los Altos. He assured me I’d make a good Jesuit as I assured him he’d make a good Calvinist. I had denominationalized the Catholic Church. It was another group along with Southern Baptists, Episcopalians, Eastern Orthodox, Methodists, and Mennonites. We prayed, studied Scripture, and worked together. Yes, we had disagreements over various points of doctrine, but it was not a problem. When I moved from California to the Washington, DC area in 1999, my good will toward Catholics was, to say the least, challenged. I was an ordained PCA minister in good standing, but I was also new to the area and the Presbytery had the responsibility to ask me a few questions about what I believed before letting me be a part of the ministry in and around Washington. It was all quite routine. Instead of howls of manly laughter, all hell broke loose. Well, relatively speaking. The ten minutes budgeted to transfer a minister into the Presbytery turned into an hour of my justifying myself, captive to hostile questions from three ministers. The sticking point was my unwillingness to pronounce the Catholic Church “no church at all,” that is, I wouldn’t affirm that the Catholic Church is nothing more than a non-Christian cult, rather, someone suggested, like the Mormons. • If the Reformed doctrine of forensic justification by faith alone is the sine qua non of the Church, why was it so conspicuously absent from discussions of soteriology for fifteen centuries? The obvious conclusion is that between the death of the last Apostle and Martin Luther’s epiphany there was no Church. That, of course, made no sense at all. • If the Catholic Church taught salvation by works, then what do thoughtful, biblically literate Catholics do with New Testament texts that affirm salvation by grace through faith? And why did every Catholic document I had ever read affirm that salvation comes only by the grace of God? Not that I ran out to purchase the Catechism of the Catholic Church during this time; nonetheless, the questions sat at the back of my mind quietly taking root. Two years later, I became managing editor of Chuck Colson’s daily radio commentary, BreakPoint. Colson, a dyed in the wool Baptist, was happy to learn from, pray with, and work with Catholics. He had lots of Catholic friends and, along with Fr. Richard John Neuhaus, founded and chaired Evangelicals and Catholics Together. Because of my work with Chuck, I got to know some of those friends including Fr. Neuhaus (I had been a First Things reader and Neuhaus fan for years), Robert P. George, Russell Hittinger, Fr. Robert Sirico, Michael Novak, and other prominent Catholic thinkers. At a conference we hosted, I became friends with J. Budziszewski, Professor of Philosophy and Government at the University of Texas in Austin. At the time he was an Anglican, but not long after was received into the Catholic Church. Those latent questions suddenly began bubbling to the surface as I had people with whom I could talk them over. The angry Calvinists I met at the Presbytery meeting and those I’ve spoken with since seem to make the tacit assumption that Catholics — including Catholic scholars and theologians — are rather stupid. After all, their doctrines contradict each other and run contrary to the obvious, face-value meaning of the Bible we share. Fr. James Schall, now retired from Georgetown University wrote, “To mock or misrepresent Catholicism seems permissible if, as it is supposed, it is composed of dunderheads who cannot argue coherently about anything, not even what they believe and the grounds for it”(“Confident Catholicism Revisited,” The Catholic Thing). These new friends, however, were anything but dunderheads. Not only did they have vibrant relationships with God through Christ, they were recognized scholars, authored academic books, had standing in the Public Square and among Protestants. They were also scary smart. Maybe they knew something. In 2006, I left BreakPoint to become president of the Institute on Religion & Democracy (IRD). The IRD was part of the Mainline Protestant renewal movement, and my first summer at the IRD included trips to three national denominational meetings: the Presbyterian Church USA (PCUSA) General Assembly, the Episcopal Church (TEC) General Convention, and my own Presbyterian Church in America (PCA) General Assembly. The impact of the first two meetings sank in as I flew between TEC’s General Convention and my own PCA General Assembly. I was reading Dutch theologian and politician Abraham Kuyper’s discussion of “the sovereignty of the individual person” and the individual conscience before God in his Lectures on Calvinism when a conversation began in the row behind me. Two women who did not know each other discovered that they had both been volunteers at the TEC General Convention. “Were you there,” asked one, “when Katherine Jefferts Schori was elected presiding bishop?” The General Convention had elected Schori, one of its few female bishops, to lead the denomination. Hmm, I thought, here we have “the sovereignty of the individual person” writ large. I was not encouraged. I could only come up with one answer: the good will of a converted clergy. And while that is a truly marvelous thing — something for which we should praise God — it also struck me as a very slender reed on which to hang the future. Given the right provocation, the PCA could, claiming the guidance of the Holy Spirit, make radical changes in Christian doctrine to accommodate the spirit of the age just as surely as the PCUSA and the Episcopalians have. How long, I began wondering, can the PCA, any other Protestant group, or for that matter Protestantism in general maintain orthodoxy in a post-modern world? Protestantism began with a strong nominalist streak (cf. Louis Bouyer, The Spirit and Forms of Protestantism), and what is post-modernism if not nominalism on steroids? The seeds of its destruction were inherent in the Protestant system from the beginning as historian Brad Gregory argues in his book The Unintended Reformation: How a Religious Revolution Secularized Society. Every individual Protestant and every Protestant denomination — really just a collection of (more or less) like-minded individuals — claims the authority to interpret the Bible and define doctrine. But the buck has to stop somewhere. In the final analysis, the buck either stops with me and the like-minded group I have chosen to join (and can choose to leave) — a very scary prospect — or it stops with a Church that actually has the authority to decide, an authority given to her by God. This was the crucial issue, settled finally as I read in Blessed John Henry Newman’s argument by inference in his Apologia Pro Vita Sua. In light of the evil brought by original sin, he wrote, the Catholic Church’s infallibility is “a provision, adapted by the mercy of the Creator, to preserve religion in the world, and to restrain freedom of thought, which of course in itself is one of the greatest of our natural gifts, and to rescue it from its own suicidal tendencies” (p. 220). It is those suicidal tendencies of freedom of thought that are killing the Protestant Mainline and infecting Evangelicalism. This is Protestantism’s Achilles heel and without the authority of the Catholic Church, the dissolution will continue. Given that state of affairs in Protestantism, it is wise, as Newman knew, to opt out of “private judgment” into the security of the Catholic Church. In 1971, I committed my life to Christ for the first time and began a self-conscious and determined walk with God. Since then, I have maintained a daily “quiet time” of Bible reading and prayer. Over the years, I have used a variety of study guides, methods, and structures. Sooner or later, I have found, one way of doing things gets stale and I try something else. A couple of weeks later, I went into the Catholic Information Center in Washington (conveniently located around the corner from my office) and bought a Breviary of my own. Once I figured out how to use it (it is not intuitive), I joined the throng of priests, religious, Catholic laypeople, and handful of Methodist theologians who pray the psalms and the seasons. That is, I began praying like a Catholic. Not only that, but I began to visit Catholic churches for prayer and often stayed for Mass. A favorite church was St. Matthew’s Cathedral, not far from my office in downtown Washington. As the head of a small think-tank, I often needed quiet space to decompress, think, and pray. When I did, I headed to St. Matthew’s. The cathedral is a huge building, as you would expect. Opened in 1913, the main mosaic over and around the nave depicts the evangelist surrounded by wonderful art-deco angels. The chapel to the right as you enter is dedicated to St. Francis and shows the Italian countryside. Our Lady’s chapel is to the left. With all that splendor, any seat is a good one. Yet after many visits, I suddenly became aware that I sat in the same pew every time. It was an inconvenient location: up front and way to the left. It was an effort to get there, but unconsciously that’s where I always sat: in front of the tabernacle in the presence of Jesus. For a Presbyterian, I was always a bit high church when it comes to the sacraments. I agreed with Flannery O’Conner who, when someone opined that the Eucharist was just a symbol and a good one, commented, “Well, if it’s a symbol, to hell with it.” I firmly believed in the real presence of Christ in the bread and wine, but a spiritual real presence only. Contrary to some ministers who feel compelled to instruct everyone that at the consecration, “nothing happens,” I believed something happened though I couldn’t say exactly what. The Real Presence of Jesus in the Blessed Sacrament is of a different order entirely. This was not some ephemeral spiritual something, but a spiritual and physical reality that drew me in. That was doubly reinforced one Sunday when my wife and I attended a local Anglican church. It is a church I know well with ministers who are friends of mine. The preaching, the piety, and the love for God and His people are on display every Sunday. It’s a great church. Nonetheless, after we found a pew and spent a few minutes praying, a panic hit me. Something was very, very wrong. I glanced around trying to figure out what was wrong. An imminent terrorist attack? Some evil influence walking in with someone? Then it dawned on me: there was no tabernacle. 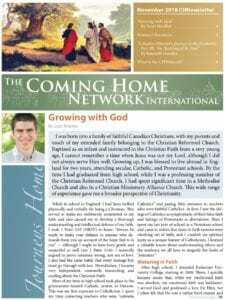 With all the reading, thinking, conversations, journaling, and prayer I put into the decision to come into the Catholic Church, that moment was the crowning event. Jesus Christ — Body, Blood, Soul, and Divinity — there in every Catholic church and conspicuously absent from every other. A few months later in January 2011, I was received into the Church at the Catholic Information Center. When people would talk with Richard John Neuhaus about the problems in the Catholic Church, Fr. Neuhaus would respond: “You don’t know the half of it.” And it’s certainly true that Rome has her share of problems. Coming into the Catholic Church is like most decisions in life: while solving some problems, it opens up a host of others. Reception into the Catholic Church is the right thing to do, but it is not a panacea. Bypassing the headlines announcing Church scandal and statements by the Pope that are far too easy to rip out of context, I want to address the personal challenges. Unlike many Protestant ministers who enter the Catholic Church, I did not give up my career. I last worked as a pastor over fifteen years ago and have since been a nonprofit executive and writer. I did, however, give up relationships that I miss. Having said that, my friends are still my friends — including minister friends who were fellow members of the Presbytery. The sad part is that while we bump into each other occasionally, we no longer see one another on a regular basis nor do we work together. The same is true of people with whom I went to church for years. Yes, we’re still friends, but we hardly ever see each other. And while that is in part due to the nature of all our far-too-busy lives in the Washington, DC region and the nature of an area church as opposed to a parish, most of it has to do with not sitting in adjoining pews on Sunday and deciding to meet for lunch. Why Catholic parishes don’t seem to work that way is a bit of a mystery, but in my limited experience, they don’t. And besides, it is hard to compare decades long friendships with new ones. Having said all that, it has all been worth it. When former Anglican theologian R.R. Reno was received into the Catholic Church, he wrote, “In order to escape the insanity of my slide into self-guidance, I put myself up for reception into the Catholic Church as one might put oneself up for adoption. A man can no more guide his spiritual life by his ideas than a child can raise himself on the strength of his native potential” (quoted in Richard John Neuhaus, Catholic Matters: Confusion, Controversy, and the Splendor of Truth). Are there difficulties? Of course, but as Blessed John Henry Newman wrote, “Ten thousand difficulties do not make one doubt, as I understand the subject; difficulties and doubts are incommensurate” (Apologia Pro Vita Sua). Difficulties are part of seeing through a glass darkly and as such are scattered throughout the Bible, inherent in every theological system, and buried in every church’s history. Are there doubts? I began with piles, but over years of reading, thinking, and discussing, they have all been sorted out or worn down to nothing. I have moved from, “The Catholic Church is not the solution, but…” to “The Catholic Church is probably not the solution, but…” to “The Catholic Church may be the solution, but…” to “The Catholic Church is probably the solution, but…” to “The Catholic Church is the solution, but…” to surrender. The Catholic Church is and always has been the solution. As Fr. Neuhaus noted, “Rest comes with surrender, with being shaken out of the state of incurvatus est [being turned in upon oneself], with submission to an other, and finally to the Other. The Other is embodied, as in the body of Christ, the Church” (Catholic Matters). And it’s good to be at rest. Dr. James Tonkowich is the author of The Liberty Threat: The Assault on Religious Freedom in America Today. For nearly five years he worked with Chuck Colson, managing BreakPoint Radio, founding a magazine, writing, speaking, and developing a curriculum including the Centurions Program. He served in business, youth ministry, and as a pastor. He has been a Senior Fellow at The Cornwall Alliance for the Stewardship of Creation and president of the Institute on Religion & Democracy. He is currently a writer, commentator, and speaker focusing on the role of religion in our public life. In addition to writing, Dr. Tonkowich serves as Special Advisor to the President for Strategic Initiatives at Wyoming Catholic College, focusing on the college’s new Center for Distance Education. He and his wife, Dottie, live in Northern Virginia. His website is www.jimtonkowich.com. Dr. Tonkowich will be a guest on The Journey Home November 16.